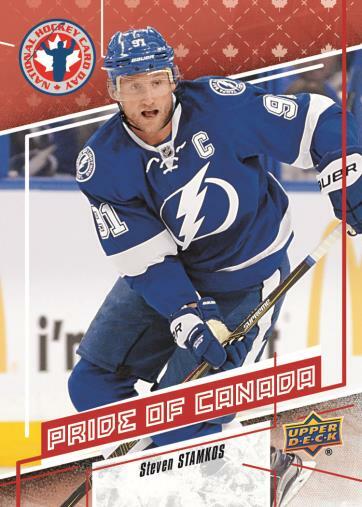 Continuing the annual tradition that includes giveaways in the United States and Canada, 2017 Upper Deck National Hockey Card Day returns to NHL collectors with more free packs. Occurring for the sixth straight year, the event takes place on Saturday, February 18, 2017. 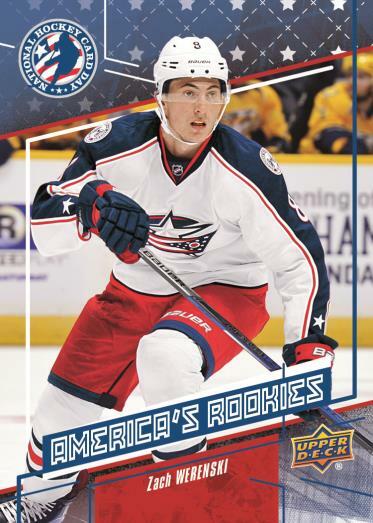 Like previous years, 2017 Upper Deck National Hockey Card Day offers different sets for the North American neighbors, each consisting of 16 base cards. 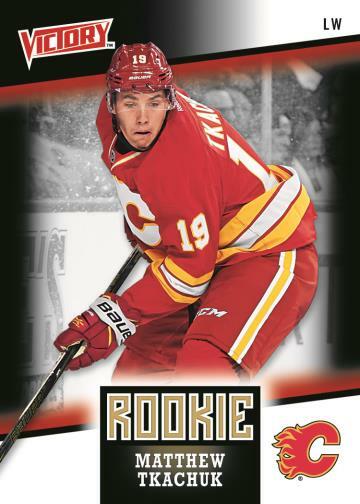 The cards cover the 2016-17 NHL season, including top rookies Auston Matthews and Patrik Laine. 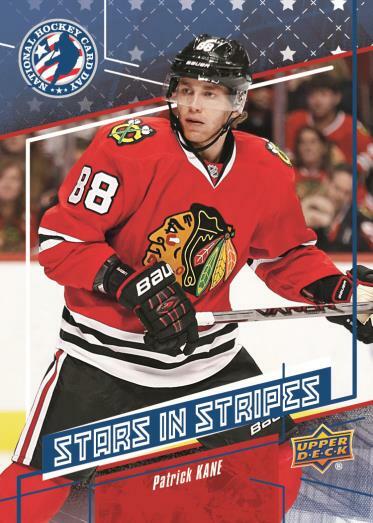 Going into greater detail, the American base set features subsets like America's Rookies, Stars in Stripes and American Icons. 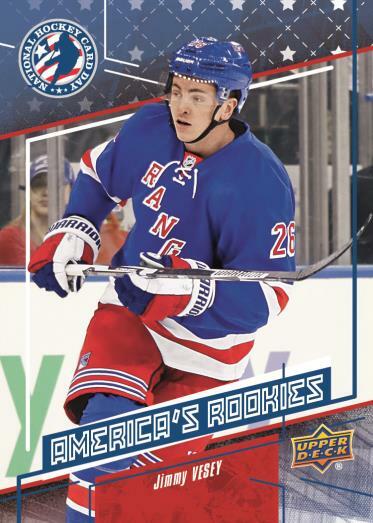 The final card in the USA set showcases rookie star Auston Matthews with a Memorable Moments theme. 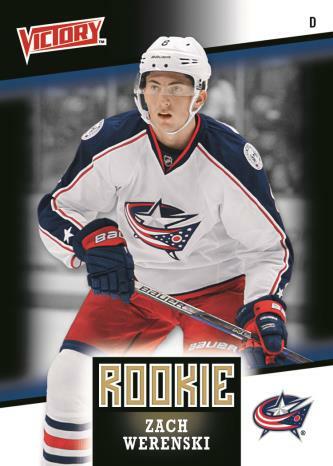 This limited card is separate from the free packs and intended to be used as an incentive for in-store purchases of $10 or more. 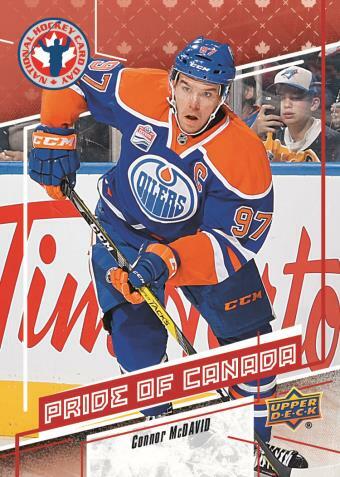 Similarly, the Canadian portion of 2017 Upper Deck National Hockey Card Day also totals 16 cards. 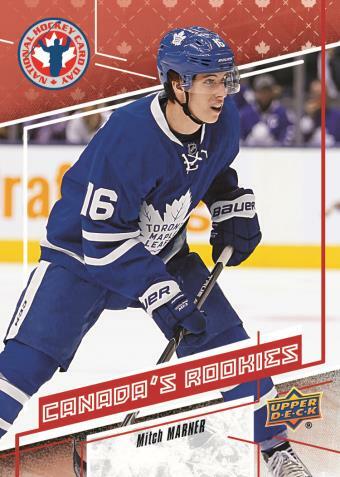 Subsets include Canada's Rookies, Pride of Canada, Hockey Heroes and a different Memorable Moments incentive card for Matthews. 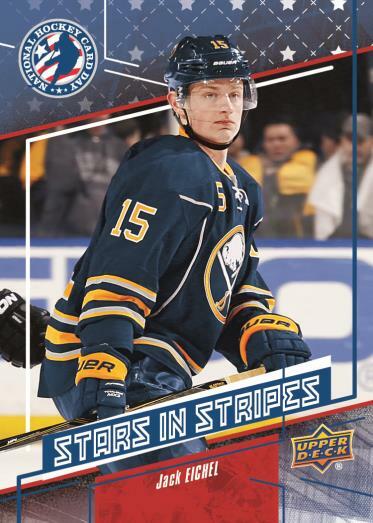 Victory Black inserts pick up on the VB numbering from the 2016 UD Fall Expo promo with ten new rookie subjects split evenly between packs in the United States and Canada. There are also rare Autographs to chase. Make sure you check the list of participating hobby shops below. It is always good to call first and double-check before you head out. 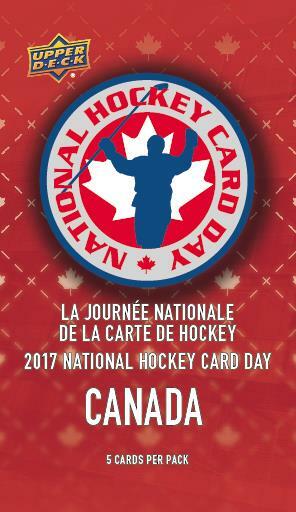 The 2017 Upper Deck National Hockey Card Day cards are exclusive to Certified Diamond Dealers and are not intended to be sold by shops. 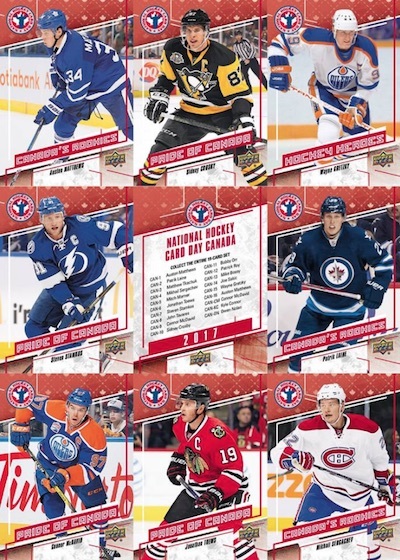 Canadian collectors can also obtain eight-card sheets (plus a checklist) for 2017 Upper Deck National Hockey Card Day at participating locations of London Drugs, Toys R Us, Pro Hockey Life and National Sports. The Hockey Hall of Fame in Toronto is another option for the sheets. 2017 PATRIK LAINE UPPER DECK NATIONAL HOCKEY CARD DAY CANADA #2!!!!!!!! 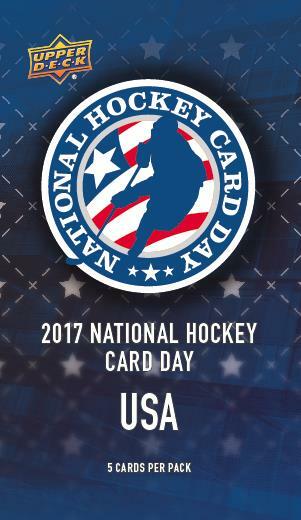 Shop for complete 2017 UD National Hockey Card Day sets on eBay. 16 cards. 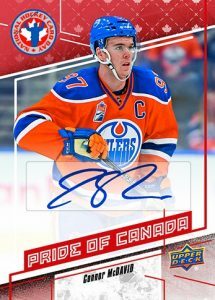 Shop Canada base cards on eBay. 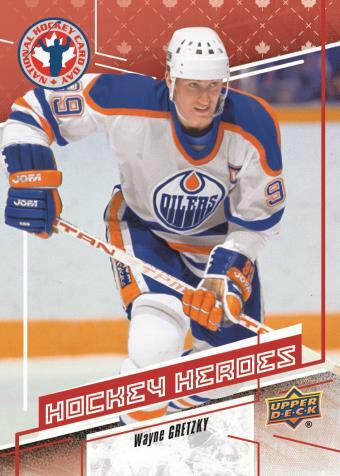 There is also an unnumbered checklist card. 16 cards. Shop USA base cards on eBay. 10 cards. Shop Victory Black rookies on eBay. Numbering continues from '16 UD Fall Expo set. 6 cards. Very limited. Shop autographs on eBay. 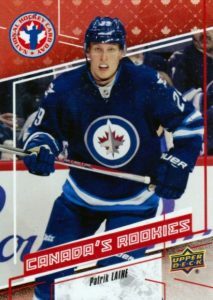 TWO (2) 2016 National Hockey Card Day USA Unopened Packs!